Lines3D is a variant classic game. You like classic Lines games, but feel a necessity of renewal? You think such games need something special and fresh to awake your interest again? We have found original solving of this problem! Let's make a viewing transformation - change a viewing angle of game field! No more flat Lines! It is time for Lines3D! There is a board of 9*9 cells. There are 6 types of balls. Player can move them around by clicking on them and clicking the place he want them to go. 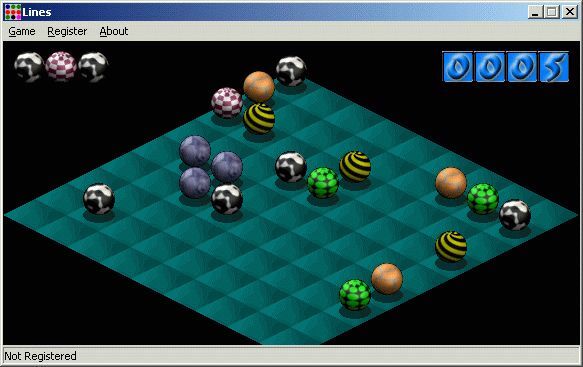 After each move another 3 balls appear on the board. Their type is randomly selected. In the upper left corner of the window Player can see which type next three balls will be. The idea is to make a line with 5 or more balls of the same type. The line can go either horizontally, vertically or diagonally. If player do that, the line disappears and player gets 1 point for each disappeared ball. There is a counter in the upper right corner of the screen that indicates the number of points. The goal is to get as many points as possible before all board is filled with balls. There is a records table, where Player can see the 10 top results of previous players.